For Chicago, click here ! , Sat 6 am-10am. Please remove all decorations, tinsel, lights, etc. Cost: $15. Note: Special Saturday drop-off, 6 am-10am, $25 for a load of mixed material, equivalent to a pick-up truck level bed full, can include a tree for no extra cost. Midwest Compost; 1320 Spaulding Rd. in Elgin, IL, 60120. Phone: 847-931-2900. Hours: Monday to Friday, 7 am-4pm. Please remove all decorations, tinsel, lights, and plastic bags used for transporting. Closed Christmas and New Year's day. Cost: $10. Algonquin - Groot will collect Christmas trees at no charge on your normal collection day throughout the month of January. In order for a tree to be collected, it must be placed at the curb or the end of your driveway by 7:00 a.m. on your scheduled collection day. All lights and decorations must be removed. Trees should not be placed in plastic bags, and any trees over six (6) feet tall should be cut in half so one person can handle them. Also, trees should be placed on top of the snow. Trees buried under snow could result in Groot not collecting them. Please contact Groot Customer Service at 1-800-244-1977 with any refuse or recycling inquiries. Aurora - Beginning Monday, January 7, Christmas trees will be picked up for free during weekly trash and recycling collection. For two weeks from Monday, January 7 through Friday, January 18, no sticker is required for collection. To be properly recycled, trees must be free of plastic bags, all decorations (including tinsel) and tree stands, and be placed at the curb by 6 a.m. on the normal collection day. Please note that due to the wire used to form them, wreaths and garlands will not be collected as recycling and must be stickered as trash. After Friday, January 18, trees left at the curb on regular collection day must be stickered in order to be collected. .If you have any questions, please contact our office at 630-892-0246. Aurora Township (unicorporated areas) - The Aurora Township Highway Department will be initiating a Christmas tree and wreath pick up service this year for unincorporated Aurora Township residents only. 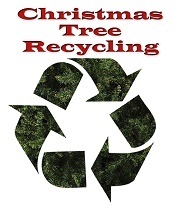 Christmas Tree Recycling beginning January 3rd. The undecorated tree and wreath pick up will be Weather permitting. No bags or plastic of any kind and please put the cut end toward the street. Additionally, the ATHD will accept Christmas tree and wreath drop offs (no bags or plastic) from any Aurora Township resident at our facility at 220 Butterfield Road. The drop off times are weekdays, 8 am until 3 pm, between January 3 and January 9. If you have any questions, please contact our office at 630-892-0246..
Far West Side (Randall west to City limits): Sat., Jan. 5 and Fri., Jan. 11). Bloomington - Christmas trees can be placed at the curb for collection. Trees must have all lights, ornaments, tree stands and bags removed. Trees will be collected from residential properties only. If you have any questions, please contact the Public Works office at 434-2225 or by e-mail to publicworks@cityblm.org. You may also visit our City's webpage. Champaign - Christmas Tree Recycling and Collection Program. The City of Champaign offers two convenient options to recycle your Christmas/Holiday tree in January. Free Collection: City residents must place their tree within four feet of the curb by 6 a.m. on Monday, January 7, 2019, for collection. Collected trees are chipped and made into garden mulch. Trees with stands, decorations, tinsel, lights, artificial snow/frost, plastic bags, or any other materials that makes the trees non-recyclable will not be collected. PLEASE NOTE THAT HOLIDAY TREES WILL NOT BE COLLECTED BY ZONE. All trees must be placed on the curb for pickup by 6 a.m. on Monday, January 7. Free Disposal: Residents may take trees to the Landscape Recycling Center at 1210 E. University Avenue in Urbana during the months of January and February for free disposal. Call 217-344-5323 for hours and details. Dundee Township - Dundee Township Highway Commission recycles trees. Bring your tree (all decorations removed) to the Township Garage at 1900 Sleepy Hollow Road (at Rt 72) December 25th through January 14th. The trees can be dropped off anytime. There are signs showing where to drop them off. We do not pick up any trees and the trees have to have all decorations removed. Call Highway Commissioner Larry Braasch at 847-426-0898 for more information. East Dundee - Holiday greenery must have all tinsel, ornaments, lights and nails removed before being placed out at the curb for pick-up and cannot be placed in plastic bags. Holiday greenery collection is FREE the FIRST TWO WEEKS in January. City of Elgin - Christmas Trees will be collected free of charge December 26 through January 11 from all residential households. Stickers are not required for Christmas trees during this period.All decorations, stands, etc. must be removed from trees in order to be collected. Do not place trees in plastic bags. Trees in plastic bags will not be collected. After January 11, each Christmas Tree will require one visibly affixed refuse sticker to be collected.Yard waste collection services (except Christmas Trees), are not provided to condominium and townhome units. Geneva - The Public Works Department has scheduled a citywide collection of discarded live Christmas trees for a two-week period in January 2019. Live Christmas trees will be collected Jan. 4 & 5 and Jan. 10 & 11, 2019 by the City's refuse collection company. No refuse sticker will be required during this period. They will also be picking up Jan. 17 & 18, 2019, BUT WILL REQUIRE A REFUSE STICKER. All live Christmas trees will be collected at the curb on your SCHEDULED REFUSE COLLECTION DAY. Residents must place the tree at the edge of pavement or near the curb for collection no later than 7 a.m. on their scheduled refuse collection dayPlease remove all hard materials, ornaments, nails, stands, etc. from the trees. NO REFUSE STICKER WILL BE REQUIRED FOR THIS SERVICE. All wreaths and roping must be placed out with normal trash on your scheduled refuse collection day. Gilberts - The Village of Gilberts' Waste Hauler (MDC) shall pickup discarded Christmas trees place on the curbside on the resident's normal pickup day after the Christmas holidays until January 31st. Maple Park - Christmas trees will be picked up on the resident's service day beginning after December 25th. Pickup will continue through the month of January. Trees must be free of all decorations. Trees must not be in plastic bags. Trees over 7 feet must be cut in half. Monday through Friday during business hours 7:00 a.m. to 3:30 p.m.
Montgomery - Allied Waste will collect Christmas trees during the first and second full week of January . Trees must be free of plastic bags, all decorations (including tinsel) and tree stands, and be placed at the curb by 6:00 a.m. on your normal collection day. No stickers are required. 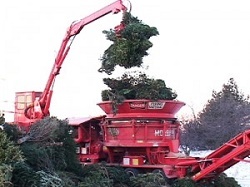 Naperville, IL - Live Christmas tree collection takes place the first two weeks of January each year (well, Dec 31 and Jan 7, 2019 this year). Trees should be placed at the curb for pickup on your normal garbage collection day and be free of tinsel, decorations, lights, etc. No yard waste sticker is required for this service in January 2018; however, yard waste stickers will be required to dispose of your tree at the curb in January 2019. Instructions and information around this change will be made available in the fall. Rockford Illinois Area - See this page for a listing of Christmas tree drop off locations from Keep Northern Illinois Beautiful, which has arranged 13 collection sites in Winnebago County for you to drop off your tree from January 1 - 15. Site times may vary. Parks are generally open dawn-dusk. Wreaths are not accepted due to wire frames. 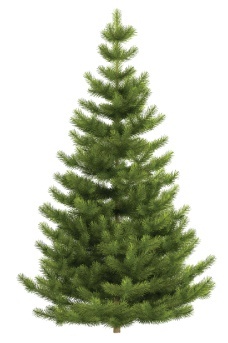 Drop-off Trees January 1 thru 15. Mulch available while it lasts, until cleared - by March 1st The trees will be chipped beginning on January 15th and the mulch produced is free for residents to take (please bring your container) through the end of February or until the supply is depleted. Christmas Tree Recycling conserves landfill space, returns nutrients to the earth, beautifies landscapes and provides free mulch for gardening. South Elgin - Allied Waste/Republic Services will pick up Christmas trees through January 17th on normally scheduled refuse days. All decorations should be removed before placing the tree at curbside. Springfield, IL - Department of Public Works crews will collect natural fir and evergreen trees for two weeks starting Jan. 2 through Jan. 13. Residents are encouraged to put the trees on the curb by 7 a.m. on Jan. 2. They should not be put in the way of traffic. There are other rules to follow: No flocking, ornaments, tinsel or other decorations can be on the trees. Wooden tree stands must be removed, and garlands and wreaths with wire won't be accepted. Residents also can drop off trees and branches from 7 a.m. to 3 p.m. Monday through Saturday at the public works facility, 301 N. 17th St. The City of Springfield Yardwaste Recycling Center (YRC) takes residential Christmas trees, wreaths, garlands and other live decorations for no charge between December 26 and January 31, 2019. The trees are ground into wood chip mulch that can be purchased at the YRC and Lone Pine recycling centers. Remove tree stands, decorations, wiring and twine. No flocked trees are accepted. Questions call the City's Recycling Hotline at 864-1904. Yardwaste Recycling Center, 3790 South Farm Road 119, Brookline. Lone Pine recycling Center, 3020 South Lone Pine Avenue, Springfield. St. Charles - Christmas trees will be picked up during the first two full weeks of January. Trees will be picked up on BOTH sides of the river on the regular scheduled refuse day. After this two-week period, a sticker will be required. Trees are NOT to be placed in disposal bags. Residents should note that all decorations, including tinsel, must be removed. For more information, contact the Public Works Department at 630-377-4405 or pw@stcharlesil.gov . Trees that are flocked or have tinsel are not accepted! No artificial trees accepted. Trees may also be taken to the Landscape Recycling Center located at 1210 E. University Ave, Urbana, for FREE recycling. The Landscape Recycling Center may be contacted at (217) 344-5323. West Dundee - Free curbside Christmas tree collections are available along with regular refuse collection during the first two full weeks in January each year, for residential properties with no more than 3 units. Trees must be stripped of all decorations and placed at the curb with the cut end facing the street. Trees do not have to be cut up, bundled or placed in yard waste bags. Trees/greenery in plastic bags, wrapped in plastic or covered with artificial snow cannot be accepted. Garlands and wreaths must be disassembled, and the organic portion placed in a yard waste bag. If you live in a building with more than three units, contact your building owner or refuse hauler regarding the disposal of your tree, or recycle it with the Dundee Township Highway Dept..
Will County - Christmas Tree Recycling. Check with your municipality to see if trees are collected curbside for recycling and composting. Winnebago County - 13 collection sites in Winnebago County for you to drop off your tree from January 1 - 15. Site times may vary. Parks are generally open dawn-dusk. Wreaths are not accepted due to wire frames. Drop-off Trees January 1 thru 15. Mulch available while it lasts, until cleared - by March 1st Click here for locations, updated information and more details.